In South Africa, the GED is recognised as a senior certificate/grade 12 by SAQA (South African Qualifications Authority). In the United States and in most countries of the world, it is fully recognised. We have been legally prevented by the SA government represent by Umalusi and its attorneys from comparing the NSC to the GED. This means with your GED, you can access tertiary courses at colleges, and in most cases, diploma and certificate courses at universities in South Africa. Internationally, you should also do the SAT College entrance exam, which is also taken at centres countrywide, and for which a course is offered by Cyber School. Should you wish to study at a university outside South Africa, then you should do the GED + the SAT via Cyber School. Should you wish to study at a South African college or only enter the job market, then you only need the GED, although the SAT is advisable as it improves the student’s knowledge of English and Maths. Should you wish to study for a degree at a South African university you will need to request a Matric Exemption Certificate. 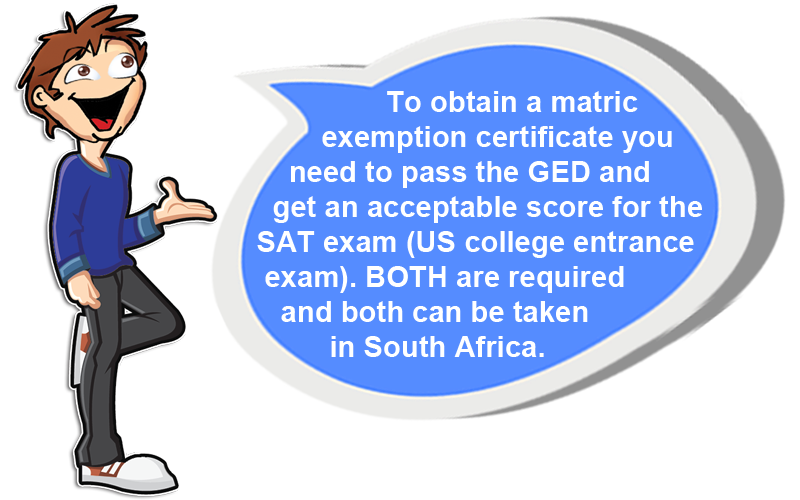 In South Africa, you need to have the GED certification converted into a South African Matric Exemption Certificate by the Matriculation Exemption Board in Pretoria to assist South African universities to recognise and understand your GED certification, as it is viewed as a foreign (United States) certification. 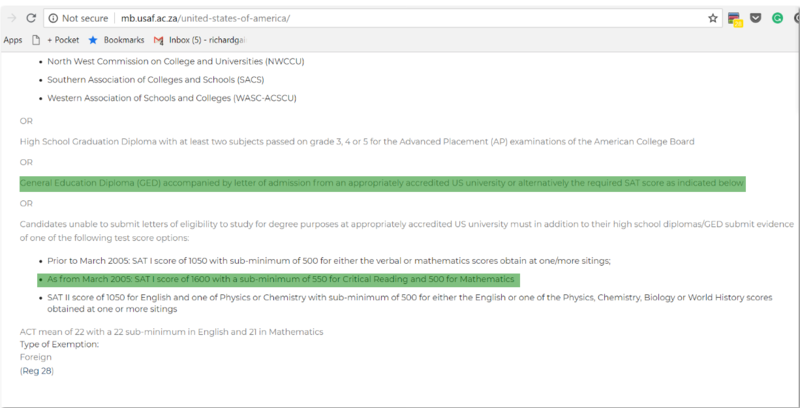 Should you wish to study for a degree at a South African university and request a local conversion before December 2019, you will need the GED + The SAT course, both of which are offered by Cyber School. See the screenshot by clicking here. 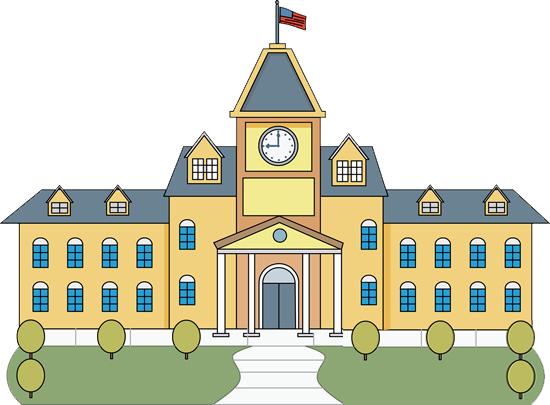 To re-iterate, this does NOT affect any Cyber School students (aged 16 by Nov 2019) taking their final GED Level 2 exams as you can apply for your conversion by December 2019. This change only affects GED Level 2 final year students from the end of 2020. Should you wish to study for a degree at a South African university and request a local conversion after December 2019, you will need the GED + a bridging course (approx. 1 year in duration) that will give you the equivalent of NQFL5 or wait until age 23, after which you can apply for a Matric Exemption certificate to gain access to a degree course at a South African university. To better understand NQFL5, see this pdf from SAQA by clicking here. There are a variety of NQFL 5 courses offered via UNISA, all of which can be done in one year, via correspondence, wherever you may be residing. See the following pdf link that shows you the relevant courses and urls. Please direct all inquiries about these courses directly to UNISA. Please note that in this regard, all our students should have completed their GED in 11 years, and adding an extra year to complete one of these NQFL 5 courses still means that the total schooling duration is 12 years, the same as at any other school using alternative curriculums.